Yes that's right, I am still enthusiastically decorating the guest bedroom in my head. The good news is - it looks like we found a house! It is certainly heading in the direction of working out perfectly, but I will wait to show you all and explain the details until we know for sure. In the meantime, I might be sold on this duvet cover for the twin bed guest room. I love love the yellow and grey palette but I didn't want anything that was bright, sunshine, I might go blind, yellow. These muted tones seem perfect. So pretty! Where is it from? So pretty! I love guest rooms. We're lucky enough to have 2 guest rooms and it was so fun picking out decor for them and stocking our guest bath with fun things. Love the idea of doing twin beds! Welcome to Charlotte! 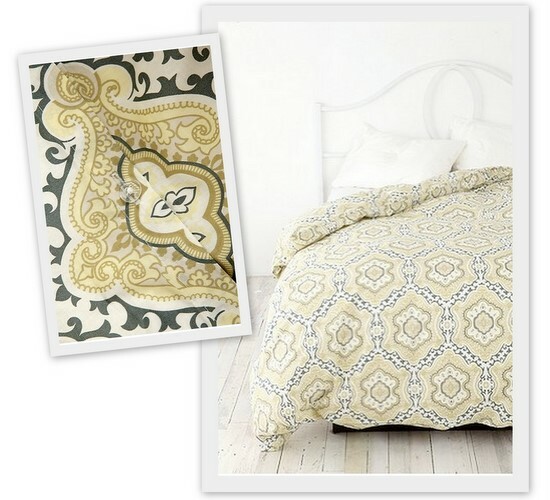 Love the bedspread, never would have guessed that was Urban! Super cute! The waterfall duvet from UO is so cute! I love this guest room. Thank you for the beautiful, inpiring website.